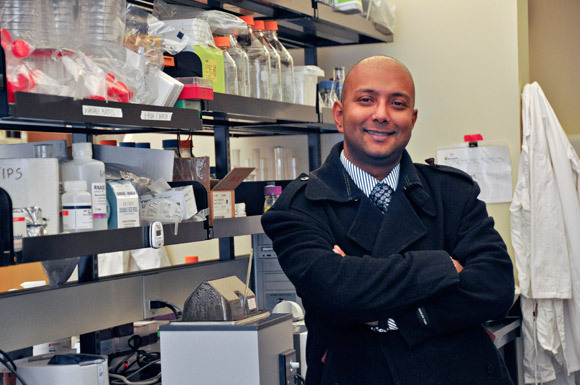 Researcher Sanjoy Ghosh, assistant professor of biology with the Irving K. Barber School of Arts and Sciences at UBC's Okanagan campus, is investigating the role Omega-6 polyunsaturated fatty acids (PUFA) play in the development of heart disease in people with diabetes and obesity. Two UBC Okanagan researchers, Sanjoy Ghosh and Mary Jung, have received research awards from the Michael Smith Foundation for Health Research (MSFHR) that will help them address two interconnected and high-profile public health issues ― the increasing rates of both type 2 diabetes and obesity and how each contribute to increased illness and death due to heart disease. Ghosh and Jung join 30 other researchers working in diverse fields of health research who were selected for funding in MSFHR’s 2014 scholar competition. These awards, presented to promising new investigators to help them launch independent research careers and build strong research programs, are worth up to $90,000 per year over a maximum term of five years.